Cracked broken grunge textured lgbt rainbow gay pride flag. Yesterday, I raised my hand at a Tel Aviv Pride event and asked Lea DeLaria, lesbian actress and star of the show Orange is the New Black, an important question. DeLaria's presence here for Tel Aviv for Pride Week is part of what we call "Pinkwashing." 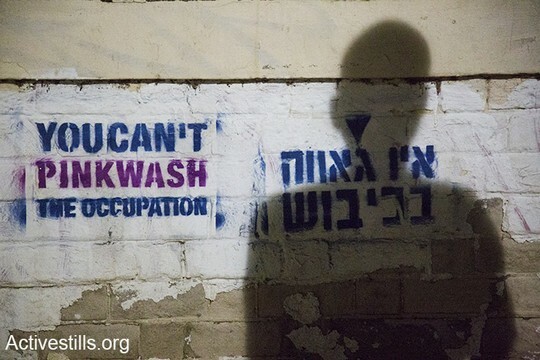 We use the term "Pinkwashing" to refer to ways that the government portrays Israel as an open, liberal, LGBTQ-friendly nation as a cover up to the fact that Israel is still occupying the West Bank and Gaza, denying the most basic of human rights to 4.5 million Palestinians. This is a deliberate strategy on behalf of the Israeli government: the Foreign Ministry organizes and funds delegations of Jewish Israelis traveling abroad in order to "show and tell" how Israel is an advanced and wonderful place for LGBTQ people, as well as promoting Israel as a "Gay Tourism" destination. This year, as usual, celebrities from abroad were invited to take part in the Pride events surrounding the official Tel Aviv Pride parade. Among those who accepted the invitation and were flown in was Lea DeLaria, a queer lesbian activist herself. Every year the Tel Aviv Pride Parade committee chooses a theme. This year "Women" was the chosen theme under the inspiring and empowering slogan "Women for a change." We hoped that this year at Pride, women would stand together to call for the changes that are urgently needed in this country. It is important for us as women and queers who suffer personally from systems of oppression, to also fight against systems of oppression that we benefit from. As Jewish Israelis, the ethnicity and nationality we were born into puts us on the side of those in power who are sustaining ongoing oppression of Palestinians. The Israeli occupation of the West Bank and Gaza deprives Palestinians of their independence and freedom of movement, creates a life of insecurity and entails being subjected to ongoing harassment and violence. While our country promotes itself as a protector of LGBTQ rights, it is important for us as queer Israelis to make it known that the IDF blackmails gay Palestinians, threatening to "out" them if they don't collaborate with the Israeli security forces. So I asked DeLaria: How do you feel about the fact that the state of Israel is using LGBT celebrities like yourself to show how liberal and gay friendly this country is, while at the same time Israel is keeping over a million people in the biggest prison in the world in Gaza, and also blackmailing gay Palestinians, threatening to out them if they don't become collaborators? While some parts of the crowd tried to silence me, the vast majority hushed them and seemed willing to hear my question and DeLaria's answer. I felt the urgency to ask this question because I believe that people coming from abroad, especially those with power and social influence, must acknowledge the fact that human rights are being violated on a daily basis. It is our job as citizens who care for our society to step up against what is done in our name. By agreeing to take part in the Pride Events without addressing and opposing the fact that Israel is actively continuing to oppress Palestinians (gay and straight alike) these celebrities are in fact complicit with the Israeli government's efforts to prevent the world from seeing the horrific reality of daily life for Palestinians living under military occupation. This year, we hoped things would be different. This was the first Pride Parade since Shira Banky, a 16-year-old teenager, was murdered last year during the Jerusalem Pride Parade. In the preparations for this week, issues of safety and security were high priorities. For my community, primarily queer Israeli women active in peace and social justice movements, we struggle with relying on the state to provide security for our community. The Israeli state is one of the main perpetrators of violence and discrimination against minorities, including Palestinians, Ethiopian Jews, and Mizrachi Jews. We know that 'security' is so often used to excuse and justify state violence. We are concerned about both state violence and the safety of our community this year. We are proud of who we are. We are proud to be women and we are proud and thankful to be part of the queer community. We are committed to changing our society to be more tolerant to all beings. We believe that protection of our rights should not trump those of others. We hoped that as a woman who identifies as a queer activist, Lea DeLaria would also understand this. Sadly we found that she did not share our view. As women and queers we must stand together against injustice and violence. A strong feminist movement should move society to oppose sexism and oppression and to support equality and freedom for all.